Process cooling systems provide solutions where cooling is required at a specific location in manufacturing or some other process. Taking a product, system, or liquid from a starting temperature to a lower temperature is the purpose behind process cooling systems. Heat exchangers transfer heat between a solid object and a fluid, or between two or more fluids. The fluids may be separated by a solid wall to prevent mixing or they may be in direct contact. They are widely used in space heating, refrigeration, air conditioning, power stations, chemical plants, petrochemical plants, petroleum refineries, natural-gas processing, and sewage treatment. The classic example of a heat exchanger is found in an internal combustion engine in which a circulating fluid known as engine coolant flows through radiator coils and air flows past the coils, which cools the coolant and heats the incoming air. The Powerblanket Circulation Blanket is an example of a heat exchanger for drums, barrels, and buckets. Powerblanket Chillers uses the same principle as a refrigerator, but instead of cooling the air inside of an insulated box, Powerblankets cool the water that flows from the chiller to the object being cooled.. Refrigeration is typically direct expansion, including an evaporator & fan system inside an insulated box, with a remotely located compressor/condenser. Most fans run continuously to maintain a consistent temperature throughout the controlled space, while the refrigeration process operates intermittently to control the required amount of heat rejection. “Today, indoor farming is a $500 million industry, and significant expansion is expected [. . .] The future for indoor agriculture looks a lot like manufacturing of the past — maximizing production and minimizing risks. It will play an important role in food security in the United States and around the world” (Kaler). Maintaining consistent temperatures while balancing humidity can pose a tricky challenge for the indoor farmer. The temperature differential can be as much as 1°F per vertical foot. Many indoor agriculture operations are looking to cooling systems that can be incorporated into the existing ventilation system. Onsite and digital monitoring controls are also improving the management of the indoor environment. A lot of beverage/food industries will use process cooling to maintain temperature while a product cures/processes. Spirits spend years locked inside barrels during the aging process. During that time, they undergo a series of seasonal climatic changes that trigger chemical changes. In this delicate process, if a spirit ages too long or too quickly, it can result in undesired flavors and aromas that compromise the quality of the spirit. Yet in a stratified space, barrels at the top of the rackhouse age more rapidly — and can easily age too long. Process cooling can be directly associated with the process itself. One of the essential requirements for plastic injection molding is proper cooling of the mold between cycles. Chilled water is most often the cooling agent of choice because it is low-cost, has excellent thermal transfer properties, and is readily available. Optimize performance when the heat is high with Powerblanket Ice process cooling systems. Ready-to-ship industrial cooling / process cooling products are available for 15, 30, & 55-gallon drums, and for 5-gallon buckets. Custom systems can be designed for a large variety of industrial cooling applications, and shipped within 2 weeks. Kaler, Mike. “Don’t Bet the Farm”. Process Cooling. January/February 2017. P 16. Stoike, Jamison. “5 Ways to Use Fans in Breweries and Distilleries”. Process Cooling, January/February 2017. P 20. Polyurethane spray foam is an extremely useful product. It insulates our homes, offices, and other structures from uncomfortable fluctuations in temperature. It keeps the cool in during the summer and the warm in during the winter. But as great as spray foam is at maintaining internal temperatures, spray foam itself is a very temperature-sensitive liquid prior to and during application.This is why you need spray foam cooling solutions for the summer months. If you’re in the spray foam business, then the above information is no news to you. However, what might be news to you is that Powerblanket offers total temperature control for your spray foam year round. Whether you’re applying in the spring, summer, fall, or winter, we’ve got you covered. Since we’re approaching the hotter months, though, let’s talk about spray foam application in the summer and the benefit of using our spray foam cooling solutions. The hot summer months can affect spray foam yield and functionality considerably. Just about every spray foam will substantially reduce its yield potential as it nears 90 °F and higher. That’s why Powerblanket offers innovative cooling systems for spray foam storage and application during the hot summer months. With the new and revolutionary Powerblanket ICE spray foam cooling blanket, you can efficiently regulate the temperature of your spray foam in the scorching conditions of summertime application. To be quite frank, spray foam cooling has never been so easy. With spray foam cooling solutions designed specifically for spray foam applicators and storage units, you can keep your spray foam at ideal temperature all the time. Powerblanket ICE uses Powerblanket patented heat-spreading technology in reverse to draw heat away from the spray foam container in order to cool the spray foam itself. Powerblanket ICE covers and insulates with the same robust system used in the Powerblanket heating products. Both the ice box and chiller-driven systems are portable and easy for onsite use (120VAC required). 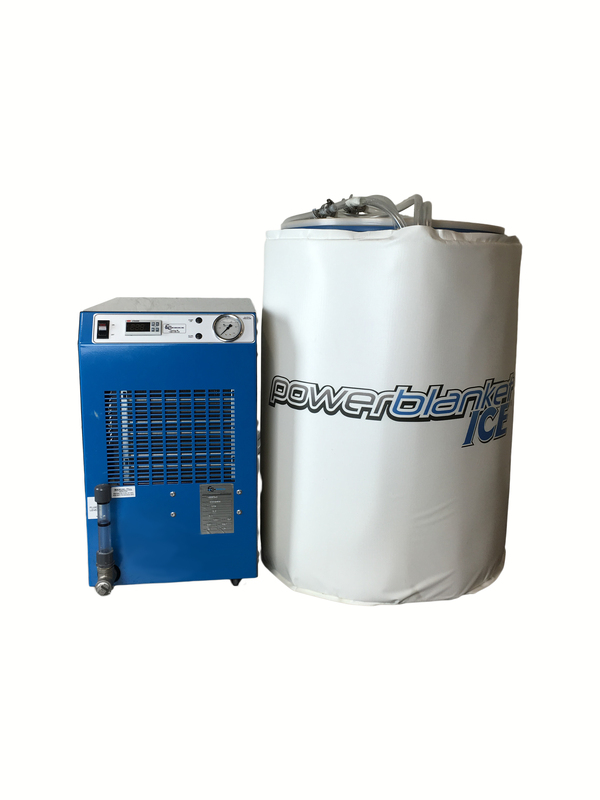 Powerblanket ICE allows you to control the temperature of bulk spray foam materials with ease. Freezing temperatures can really put a halt on your spray foam business. However, hot weather can do just as much to disrupt the continuity of your operations. Spray foam that sits in temperatures over 90° F will not yield as much as spray foam that’s at or below room temperature. This is because spray foam activates due to a chemical reaction that produces heat. If it’s already hot outside, the spray foam will react too quickly, and won’t have time to bond to the surface it needs to insulate. This can lead to the foam pulling up and not sealing what it needs to for proper insulation. The business of spray foam is a year round endeavor: rain, snow, sleet or hail.But as you know, hot weather can have a detrimental effect on your spray foam too. How do you keep your spray foam protected from the heat of the summer months? Alongside Powerblanket’s spray foam heating solutions, we now offer an equally innovative line of cooling solutions for the spray foam contractor. Our North Slope Chillers product line enables you to keep your spray foam at ideal temperatures, even in the hottest summer weather. With that, we proudly introduce your new spray foam cooling savior: Fluxwrap. Fluxwrap uses Powerblanket’s patented heat spreading technology in reverse to draw heat away from the container, thereby cooling the product inside Fluxwrap outer shell and insulation are the same as the robust system used in Powerblanket products. The new line of North Slope Chillers’ spray foam cooling solutions come in lower cost, mid-grade, and premium options. Our cooling products can be provided for custom applications quickly and cost effectively, just like our heating products. Just get us the details and we can have a product in your hands before you know it.